Anthony is two-time Notre Dame graduate with a strong interest for Fighting Irish football. He specializes in statistics as well as X's and O's, thoroughly enjoying the schematic chess matches that play out over the course of the game. Anthony has been published at Blue and Gold Illustrated as well as in the Maple Street Press annual Notre Dame preview magazine Here Come The Irish. 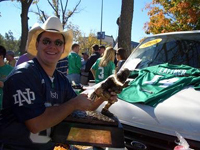 He is also the co-creator of the AV Ranking (AVR), a computer football ranking system published on Clashmore Mike and used to monitor the national college football landscape. The Irish travel to East Rutherford, New Jersey to take on the United States Naval Academy this weekend. Notre Dame is 14-0 in the Garden State including an 11-0 record in Meadowlands Stadium. The game against Western Michigan provided the perfect opportunity for first-year head coach Brian Kelly’s squad to show something lacking in recent Irish teams—a killer instinct. Unfortunately, it didn’t surface , at least not in the first two quarters of play. Another week, another series of undefeated and highly ranked teams falling victim to the upset bug. Ohio State, downed by the Badgers in Madison. Nebraska, done in by a swarming Longhorn defense that allowed a long gain of 14 yards on the ground. South Carolina, outscored 21-0 in the second half by Kentucky after going into the locker room with a 28-10 halftime lead. Saturday marks the midpoint of head coach Brian Kelly’s inaugural season. To date the Irish have posted a 3-3 record against the 4th most difficult AVR strength of schedule, with two of the losses coming by narrow margins to top 25 teams. Fortunately, the next three games feature three very winnable contests. Another week, another opportunity to extend an early lead and come away with a decisive victory. Much like the season-opener against Purdue, Notre Dame had Pittsburgh on the ropes with a 20-7 lead early in the third quarter, only to let the Panthers back in the game.